What do you make for lunch, or dinner for that matter, when there seems to be nothing in your fridge? 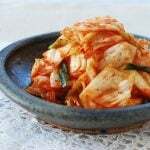 For Koreans, it’s usually a dish made with kimchi because there is almost always some kimchi in our fridges. Lately, we’ve had many friends and family members visiting for the summer. It’s been a lot of fun but a lot of work as well. I am finally taking a break from all the cooking and grocery shopping, which is why my fridge has nothing substantial. So, I decided to make kimchi bibim guksu for our weekend lunch. 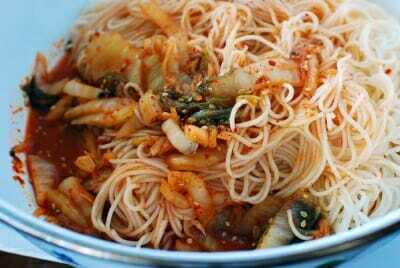 Unlike my other bibim guksu recipe, kimchi is truly all you need for this humble dish. 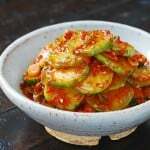 But, you can add other vegetables such as cucumbers or lettuce, if you want. I added some perilla leaves (kkaennip) a wonderful friend of ours gave me from his garden. 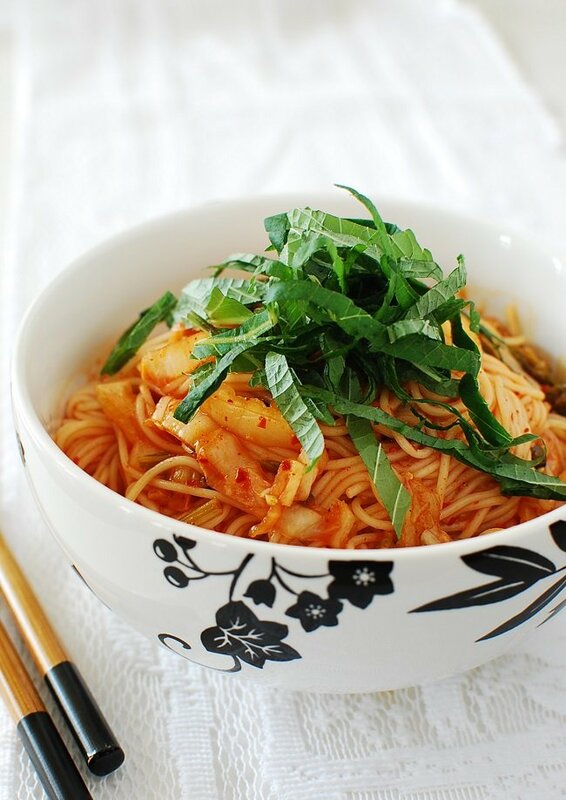 In no time, these spicy, sweet and tangy noodles were ready for our table. 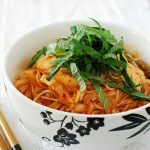 A simple cold noodle dish made with kimchi! 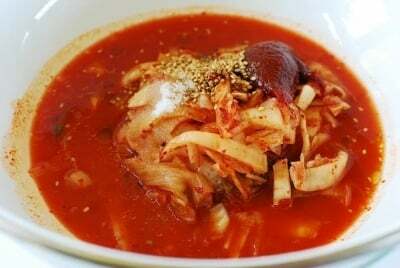 Hi Hyosin, this looks like a great, simple, and refreshing lunch! 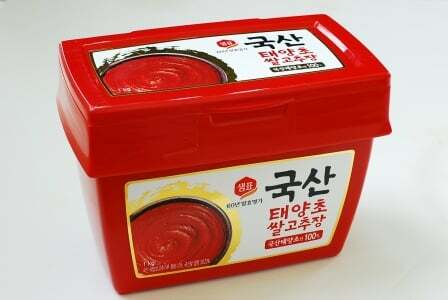 Do you have any tips on how to mix the sauce with the somyeon? Whenever I cook thin noodles (like angel hair pasta, for example), they always like to stick together! Do you use a spoon, or would you recommend mixing with your hands (wearing gloves)? erica – I mixed the noodles by hand wearing a kitchen glove. But, the pictures did not come out well. That said, you can also use kitchen tongs or chopsticks instead. 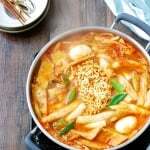 Try to rinse somyeon noodles in very cold water a couple of times until the noodles are cold and use them right away after draining, so the noodles don’t get sticky. 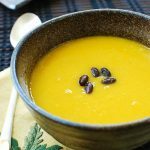 The sauce in this recipe has a lot of liquid, which also helps with mixing. Hope this helps and you get to try the recipe. I know you will like it. Andrea – It’s one of my favorites too. Isn’t it nice when something you love doesn’t take much to make? Thanks for stopping by! Very beautiful bowl full of delicious noodles! Wonderful recipe with tasty photo! Thanks for sharing, and have a wonderful Sunday! Thank you, Sandra! You have a great day too. Baobabs – Thank you for the nice words! And thanks for visiting. I love your blog!! Now I can make all the yummy Korean food I want without having to go to a restaurant! Pierre – Sounds like you need to start making your own kimchi. ha ha! It’s always my pleasure to see you here. Thanks. Amy and Tiffanie – Thank you for the encouraging words. I would love to hear how my recipes turn out for you. Cheers! 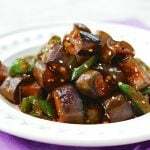 My favorite Korean summer dish!! Thanks for sharing, can’t wait to try this on my own. I like cold noodles…I don’t do high fructose corn syrup though…I bet honey would be a great replacement! Hi Hyosun! My mom was visiting for 2 weeks and all she talked about was her trips to Korea and all the good food she had. Her visit was too short, but I really want to cook something for her from your recipe collection. Well, she probably knows a lot more food than me. I heard from a foodie friend recently that Korean also use perilla leaves (we call it shiso leaves). I was so happy to hear that because shiso is my favorite addition to the food… This noodle looks delicious Hyosun! 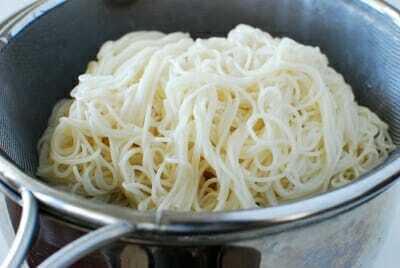 This is a lovely bowl of cold noodles. Looks great for summer. I will have to give this a try when it’s summer here in Sydney. Does it have to be somen noodles or can I use other types of noodles? Nami – Thank you! Hope you had a great time with your mom during her visit. Also, it sounds like your mom really enjoyed her trips to Korea. Who wouldn’t! ha ha. I know the food there is amazing. I am sure the same is true with Japan, and I really hope that I will one day travel to Japan. Spoon and Chopsticks – You can use any types of noodles. Hard to imagine, but hope it’s not too cold there for you. Thanks for stopping by! 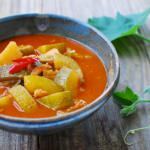 Spicie Foodie – Thank you for visiting and leaving the nice comments. Hope you get to try the recipe. Hallo! 🙂 I made this for lunch yesterday and it was so delicious. Reminded me of my mom’s bibim gooksu, which I thought was the best thing ever. Thank you so much for this recipe and I’ll be making this at least once a week! Fin – That’s great! Very happy to hear it turned out delicious for you. It’s such an easy noodle dish to make. Isn’t it? I love Korean food. I think I ate more than enough when I was there during Christmas time. These noodles look really delicious yet easy beyond belief to make. I think I can find all the ingredient here in Tokyo. Tataya – Thank you! I hope you had a wonderful time in Korea. Yes, this dish is very easy to make. Let me know how it turns out. Cheers! Thank you got posting one of my favorite noodles and for giving me ideas for what to do with my perilla leaves in my garden. Lettuce wraps, spring rolls, and kimbop rolls could also use a little extra flavor burst from the perilla leaves. Yes, perilla leaves are great in all those dishes. Love them! Oh man this looks so good! Oddly enough without knowing this was actually a thing, I’ve been doing something similar at least once week. When I don’t want to cook, I heat up some rice, top it with kimchi, gochujang, sesame seeds, and a fried egg with a runny yolk and eat with a side of whatever veggies I have peeled/sliced in the fridge – usually carrots, cucumber and radish. I’ll have to try it with noodles sometime too.